littleSTEPS® provide an affordable alternative to custom orthoses, enabling early intervention and treatment of many common musculoskeletal conditions. littleSTEPS® are specifically designed for kids to deliver a prescription based correction, closely matching the criteria of UCBL devices. 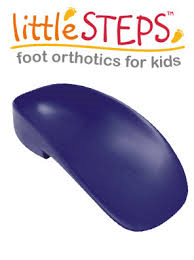 littleSTEPS® Have excellent arch support to assure both comfort and correction. littleSTEPS® Now come in 7 sizes from toddler size 8.5 to children's size 6.